I've been pulling back on a lot of gear and trying to become way more focused for my systems. I've completely change the 12u I posted on page 2, actually removed all IME/Harvestman. 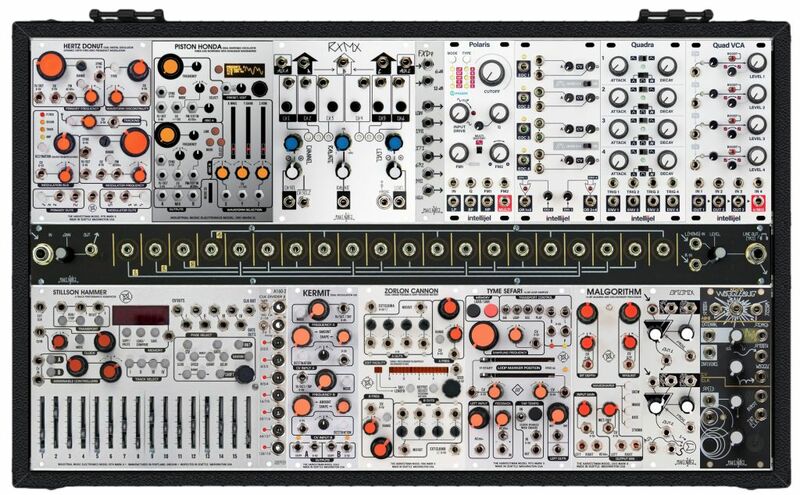 Which was good, because today I pre-ordered a Makenoise CV bus case specifically to be a smaller portable fixed system. This is what it will be. I'll post a real pic eventually. dysonant thanks! I'm loving it. The case is almost complete! Photos to follow. Looks like our cases have a lot of overlap. The Quadra, expander and quad VCA is a great idea. I thought about going that route. And the Wogglebug solves my biggest complaint; I feel like the Harvestman/IME collection is really lacking a complex random CV source. I did mention this to Scott. I'm hoping something is in the works. The clock divider is crucial. The RxMx should be pretty awesome too. I debated snagging one. In the end I found a used Dubmix with expanders for a good price, that I have now pulled out and put in a Move104 in front of the case. I didn't want a performance mixer like the WMD. The RxMX seems like a great solution. 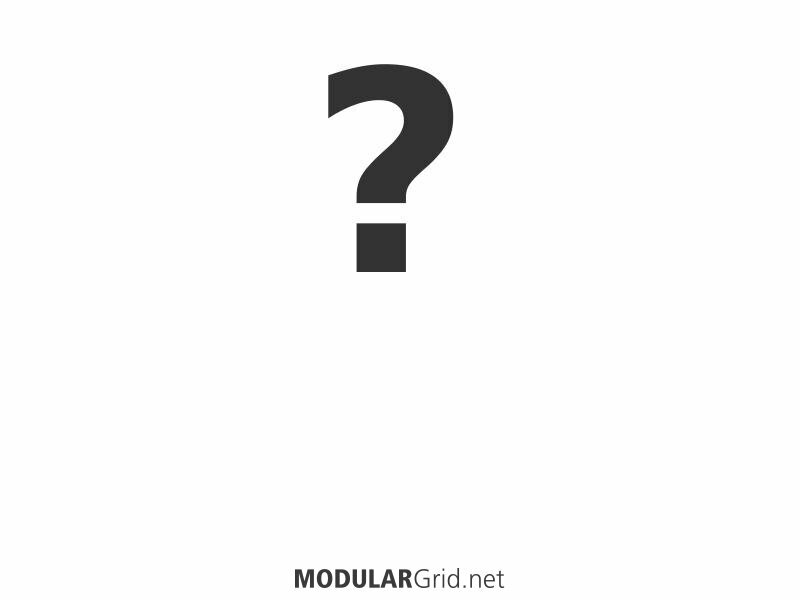 What about these module alternatives? 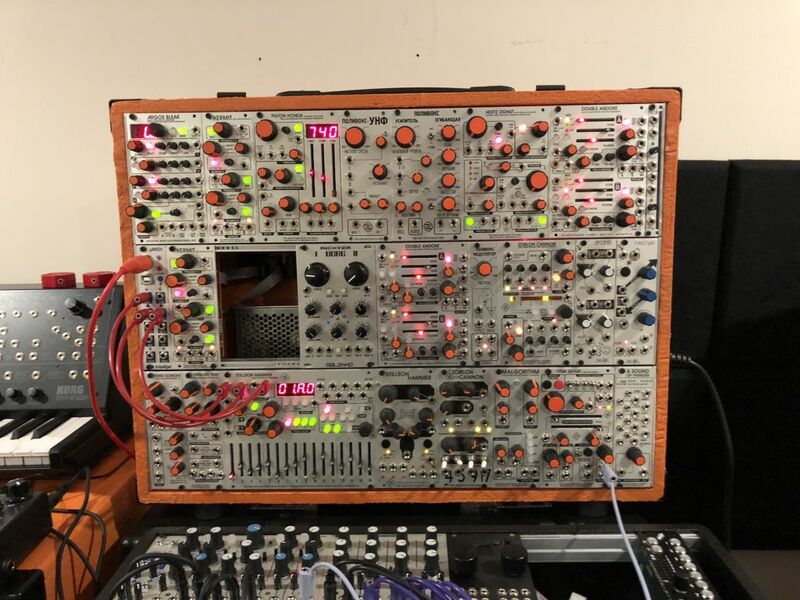 The thread is about Harvestman set ups, which often includes other modules. RCD is a great idea and would definitely add some flexibility, but what I really like about the A-160-2 is it will divide up to 128 and even better it divides by primes numbers. A switch is a really interesting idea. I have an SSM. I think as I use the system more and try to develop music and performances on it, I will certainly reevaluate. I've played around with the ZLOB at a meet, it is a really awesome little module, but perhaps a little tightly packed. I plan to sometimes use manual control on the Quad VCA for bringing things in and out. Which bring me to the RxMx. I will not really be using it as a final mixer but more to mix things earlier in the chain. I'll likely output the Quad VCA into the Aux of the Optomix then to final out. This will all have to be tested. Finally, this system is very loosely inspired by the signal flow of the DFAM. Since it came out I have been patching up similar flows. However, I greatly expand the capability by having more sound sources, more flexible mixing and routing, way more sequencing and several element unavailable on the DFAM. Patching that signal flow got me inspired to make a smaller, complete system, but with the ability to create several voices at once. I will certainly refine this system as I learn it, i think I might be able to squeeze a few more things in there by getting smaller modules, but I also want to balance playability. hey guys. 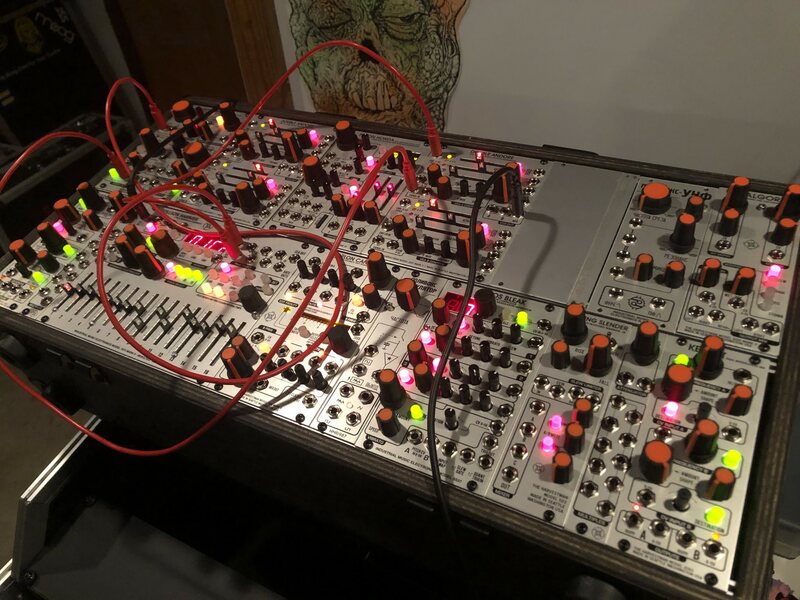 I've been bitten by the harvestman bug - the power of digital with an intuitive interface that doesn't cut too many corners - it's just right up my alley. They compliment my makenoise and noise engineering modules very well. here's a little plan for a 12u 84hp live techno performance case I'm working on, designed to be paired with a digitakt and a cv.ocd. The big question mark in the upper right corner is the upcoming mordax GXN granular processor. the black modules in the lower left corner are prototypes of the Voltage Interpolation Assistant(which is an utter powerhouse of a module... check out the manual). The general idea for this case is for the DPO and PHMK][ to be the two main voices, switching off lead and bassline duties. The GXN paired with the first short-bus and the lyra-8 FX module will create a super grungy distorted version of clouds, sampling from all of the different sound sources in the rack to create harmonically related ambience. The zorlon cannon will provide clocks, random voltages, and noise to use for percussion depending on the patch. PPx2 + Brains provides sequencing and tactile control over different parts of the patch. The T-Rackonizer will act as a master stereo filter, multi fx processor, and distortion for my final audio output coming from my mixer to glue everything together and add a little bit of color. what do you guys think. am i missing anything? is there anything you'd do differently? I can no wait any longer... this has been on the cards for soooooooo long ... feel like I am going to burst!! The only quandary I have is what to do with the Polivoks VCF, I have it in there now, will be sorry to see it go. I guess I could swap it with the Malgorithm as the mood takes me? One thing I might suggest: compressors, compressors, compressors. Start a separate rack/skiff for the Polivoks system. I would say wire a PSU for yourself, or mod your case so you can mount your Row Power on the side (I did that on the controller skiff we built, pretty nice). I also debate keeping SOT for my TS. I bought it initially to have the stereo option, but I find I don't use that very often. Those two would give you more than enough room with some clever shuffling. You know I'm surprised no one's offering wired PSUs (that I know of). It would be pretty easy to wire up a 6U PSU and ship it for install by the buyer. I guess it's a liability. But I'd be willing to do it in the US. I really love the pitch shift mode and format switches on SOUND OF THUNDER. But i think that Malgoritm can do what the format and bend switches do (soundwise not adding sample lenght). So if you like stereo, pitch shift and longer sample time keep the SOT. Hehe mt3 - oh no - not another case!! Really, I can't, it's already waaaaaay out of hand!! I too wonder about the SOT - I do like the stereo - actually, sometimes that's about all I like, well I also like the format switches, but find these and the circuit bending options too hash for my tastes even though I do like it harsh sometimes! Ha. I was going to say the same thing. The Akai/Emu/Casio "vintage" bit depths. I guess my main complaint is the circuit bent stuff does nothing for me haha. But yeah, I would miss stereo and pitch shifting. But the Polivoks VCF is wonderful. Fortunately I don't have to make that tough decision. I was 1 hp short. But after messing around with my rails/brackets a bit and a little burring of the bracket, I squeezed out an extra hp to fit it in haha. Now all that's left is the PH mk III and some orange knobs. The BL II will eventually replace the Dual Borg. And I may replace the Polivoks ADSR with Andore. ... I was 1 hp short. But after messing around with my rails/brackets a bit and a little burring of the bracket, I squeezed out an extra hp to fit it in haha. Also had the idea to take the threaded strips out and chop them into pieces to allow things to bunch up together a bit more. The thought has crossed my mind that the 'inaccurate' panel sizes were intentional for this very purpose. 13hp? 32hp? Hmmm maybe 12.8hp or 31.2hp? Filing the side of the panel was my next step haha. I've even consider filing down the PCB a bit ha, but maybe that's extreme. There are a few modules where the PCB and panel don't perfectly line up. A little frustrating. I think I'm going to have to do something with the row above as well. BTW I'm all for sliding nuts. They definitely save space. And I've had the same thoughts that perhaps not all panel sizes are precise. If I had authority I'd abuse it and make this a sticky. ALL WMD modules are next of kin complements to IME. Bottomless, especially the Synchrodyne, which goes from negative infinity to positive infinity and back. Agreed with the Zlob. Compact is great but not for performance. Hard to even patch cables into this motherfather. I also really liked the Mixiplexer. Been eyeing Hinton's stuff as well as other submixers. 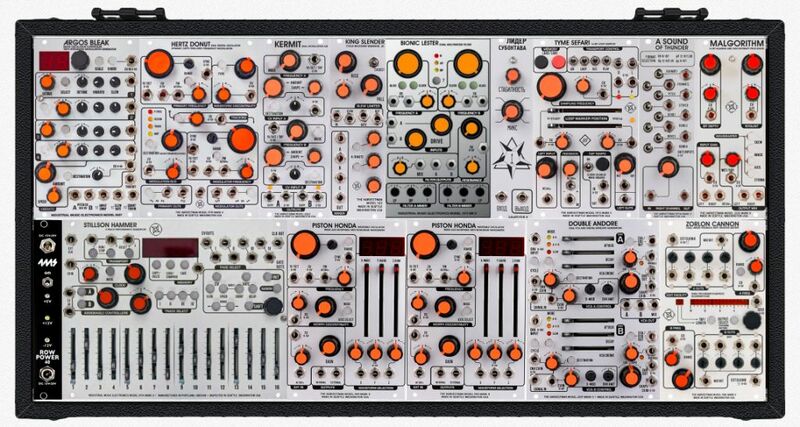 Alright folks, so I decided not to get the Make Noise 7u w/ CV Bus and got an Intellijel 7u Stealth case instead. 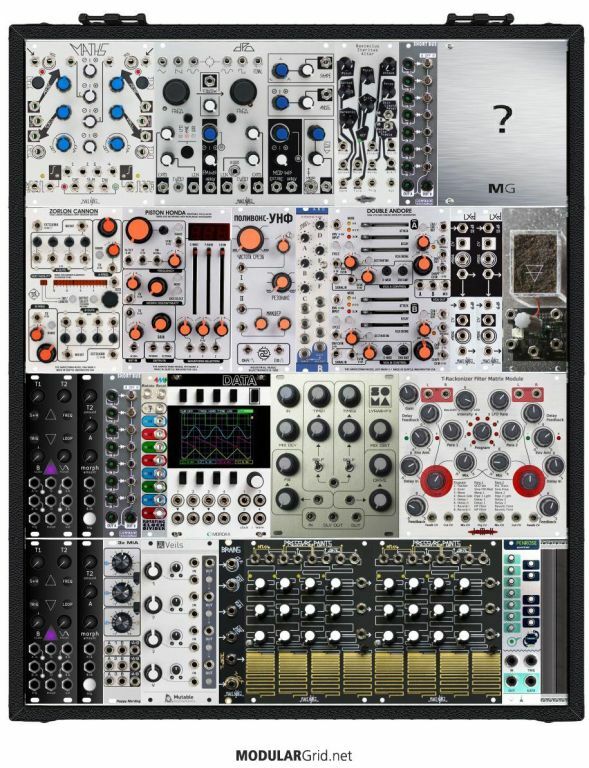 The current setup can be seen here https://www.modulargrid.net/e/racks/view/631877 However, I have been considering what I will do when the Single Andore comes out and some other things.  This is the direction I am headed in https://www.modulargrid.net/e/racks/view/656501 (cannot get pic uploads to work for some reason) I'd be curios to hear your thoughts. I feel a bit like Stages might be better suited for this system than the Quadra w/ Expander. The TBVCA, Tangle Quartet, and the Listen Four all seem more appropriate for 1U modules (to save space). Zorlon, Wogglebug, and Noise Tools seem redundant for the random facilities.